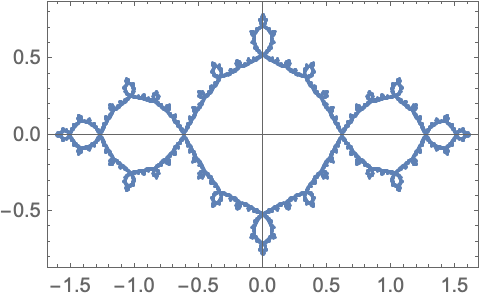 plots the Julia set of the rational function f of the variable z.
plots the Julia set of the function . 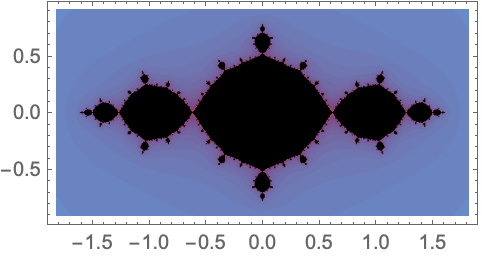 The Julia set of a function f is the closure of the set of all repelling fixed points of f.
The possible methods are "InverseIteration", "EscapeTime", and "OrbitDetection". 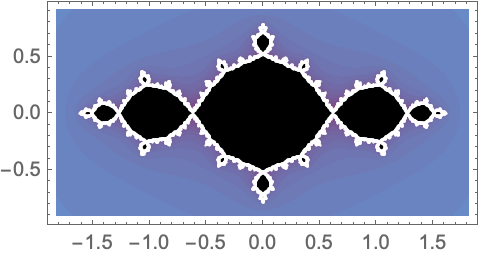 With Method->"InverseIteration", JuliaSetPlot produces a ListPlot showing individual points of the Julia set. With Method->"EscapeTime" or with Method->"OrbitDetection", JuliaSetPlot produces a Graphics object containing a Raster primitive. 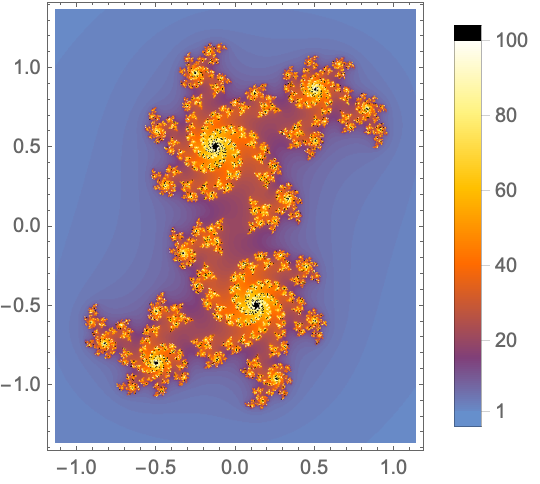 With ColorFunction->f, where f is a function, the argument of f is a real number in proportional to the number of iterates, and f must return color directives, such as RGBColor and Hue, or named colors, such as Red and Blue. ColorFunction->"name" is equivalent to ColorFunction->(If[#1,Black,ColorData["name"][#]]&). The list of possible color function names is given by ColorData["Gradients"].